Your patio door opens onto a covered patio/walk way. For those on a budget we have a hotel style room with a queen bed, bath w shower, flat screen TV, under-counter fridge, coffee maker and microwave. Very comfortable new mattress. The courtyard outside your sliding glass doors has a table and 2 chairs in the shade. 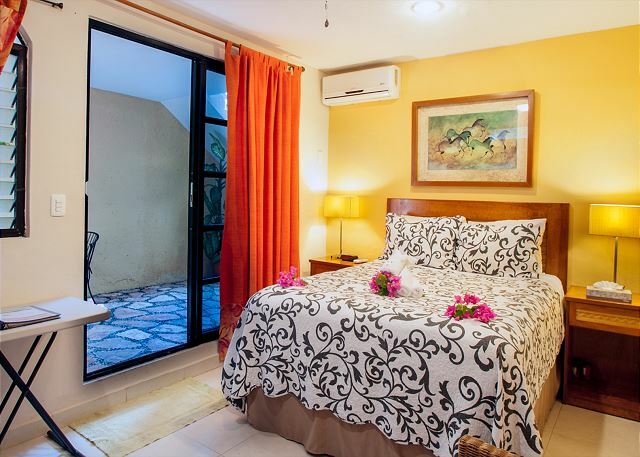 The Abbey del Sol property also has 7 comfortable, well-appointed apartments with fully equipped kitchens. Rent individually for couples and small families or in combination for groups and large families. 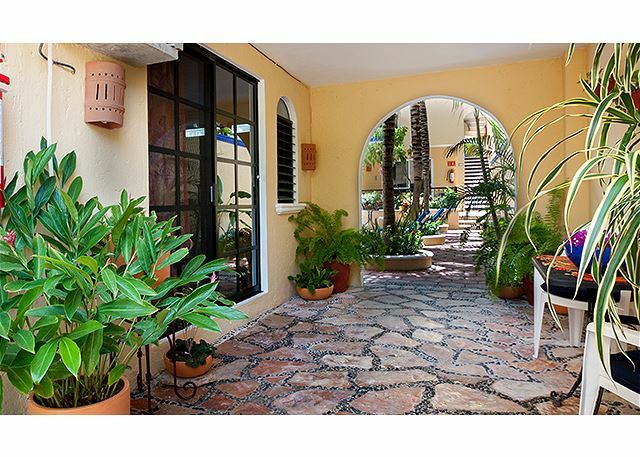 Beautiful gardens, refreshing pool, free Wi-Fi and many amenities. 2 blocks to the beach and 8 blocks to the town square. We arrived after flying into Cancun. Very pleased to have escaped the touristy resorts. This place was in a beatiful location and the hosts were kind and helpful. I was pleasantly surprised at the spacious yet cozy apartment at Abbey del Sol. The feeling inside the courtyard was like being in an intimate compound. The staff was friendly & helpful & the apartment & grounds were clean & well kept. I would recommend it to friends or stay again myself. The only negative is that the mattress was ready to retire. Thank you for coming to stay with us, we appreciate you feedback. We only hoped you let us know during your stay that mattress was not comfortable for you, we could have done something about it then. We love to have you back! from the moment the door opened i loved the little suite. the kitchen area had a good coffee maker and microwave,and a small fridge which was great. the bed was very comfortable with numerous pillows. the air conditioning was really effective. the water pressure for showering was above average. my husband and I would highly recommend this property. its a very quiet neighborhood, and within walking distance to everything. Thank you Jay and Dan for your feedback, we appreciate it. We hope to see you next year! 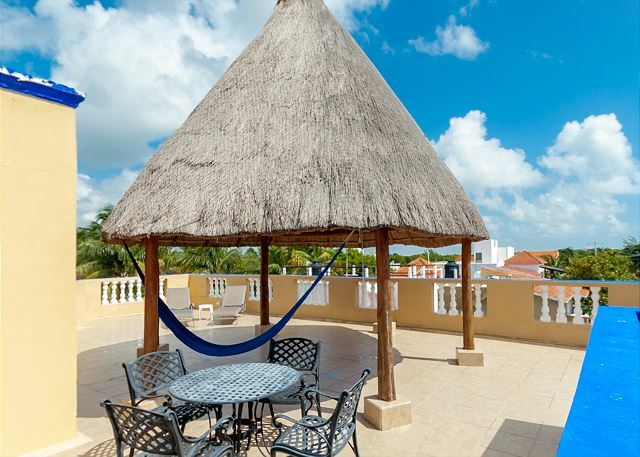 Abbey del Sol has long been our family's go-to rental in Puerto Morelos. This is the only time we have not rented a house (Casa Anita). We needed to be in town for a few days, and as this is a popular time to visit the town (we prefer off-season), this lovely hotel-style room was all that Abbey had available. It was perfect for our needs--clean, cool, nicely decorated, coffee for the morning, etc. Hola Carol and Martin, happy to accommodate you any way we can. 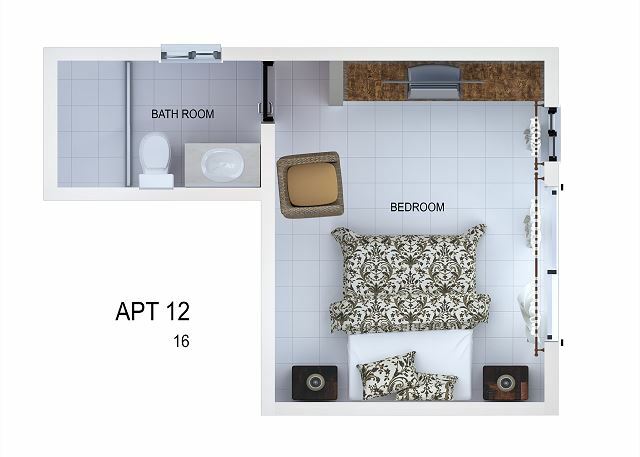 Apartment #12 does have everything but the kitchen sink ! The rooms and facilities were extremely clean and comfortable. Gorgeous properties with pools and greenery. Only a few meters from the beach and nice beach club! Very helpful staff and super kind. I wouldn’t definitely come back! Thank you Alexandra for your comments, we hope to see you in the near future! Best little budget vacation stay ever! Awesome location just off the beach. 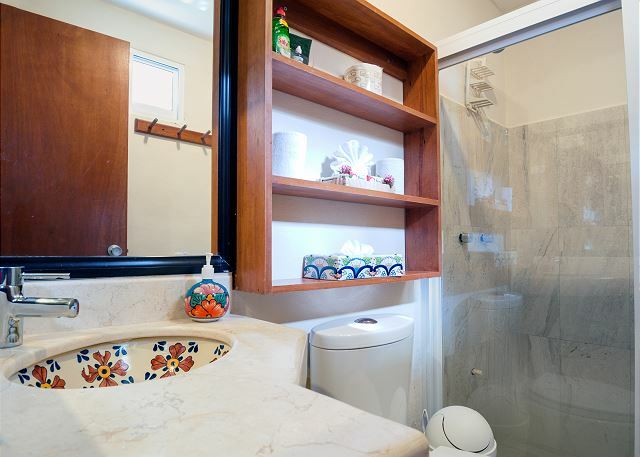 Property is super clean and has absolutely everything you need. The staff is very friendly and are willing to assist as needed with activity recommendations, transportation plans and overall stay satisfaction. I look forward to returning soon!! 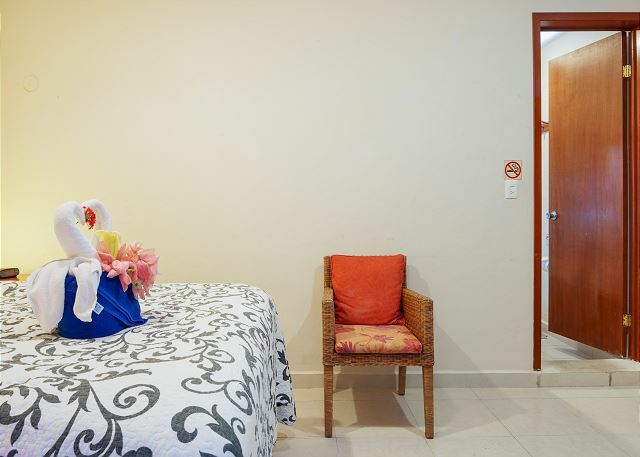 The apartament has everithing yopu could need, really confortable and clean, we loved every single detail of Puerto Morelos and Abbey del Sol. The possibility of used the hotel's bicycles for free was something extra that we didn't expect and that's one of the reasons why we would go back to Abbey del Sol. But after everything, the most enjoyable thing of our stay in Abbey del Sol was the people who works here, that's why my review's title is wonderful. Thank you very much for your feedback, and you are totally right we have a great team that works very hard to make our guest feel happy and confortable during their stay with us. We hope you have a successful school year! Love the Staff and the rental properties are fantastic. Thank you Rick, we love having you and your wife come and stay with us. Happy to choose Abbey del. Sol, comftable room, enjoy in the pool abd all the facikities I required, the bycicles to ride in the town makes a very good experience and the staff is very kind, they attended all. My concerns. Thank you very much! I have been going to Abbey Del Sol for about 6 years and each time the accomendations are great. Everything is as advertised online. The appartments were very clean and well maintained. The staff all very helpful and friendly. Meet lots of guests I have seen there from previous years. Great place to stay. Peaceful, secure and very accommodating staff. Great little pool and a delightful roof patio. We had a great stay at Abbey del Sol, and loved Puerto Morelos. The bikes were an especially nice touch, and made staying at this property easy, quiet, and comfortable. The staff went above and beyond to help us have an excellent stay. Everyone was so friendly and helpful. Felt like being at home. Thank you again! Very clean and friendly staff, good location. This property was in a perfect location for me! Clean, quiet and very comfortable. Highly recommend! Wonderful experience!!! Everthing neat and clean, pool was perfect and excellent security. Extra towels and bed sheets along with laundry service on site. Short walk to beach!!! 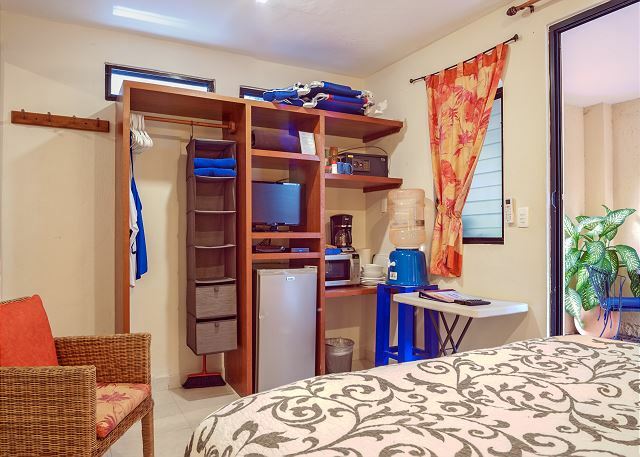 We had only visited Puerto Morales once for snorkelling and decided we would like to come for a few days this year.I booked on line and was very pleased with the results.The apartments are just as described very nice,clean,and very quiet. We ended up being upgraded to apartment #8 since #12 wasn't ready when we arrived. It was great having a kitchen to have snacks and drinks available. Our room was clean and spacious. We really liked having two rooms. The pool is small, but a perfect size for the building. Abbey del Sol is a couple blocks from the beach and about a 20 minute walk to downtown Puerto Morelos... or a 30 peso taxi ride. I would definitely stay here again if I find myself in PM again! Second time here. The rooms are very clean and accommodating. The pool area was really cool. But the one thing about Abbey del Sol is the amazing staff. Nancy, Jin, Vicky, Hugo, Rosario, all treat you like family. Highly recommended. It ended being the best one week break from both work and winter season. The accommodations were exactly what we needed for our week away. 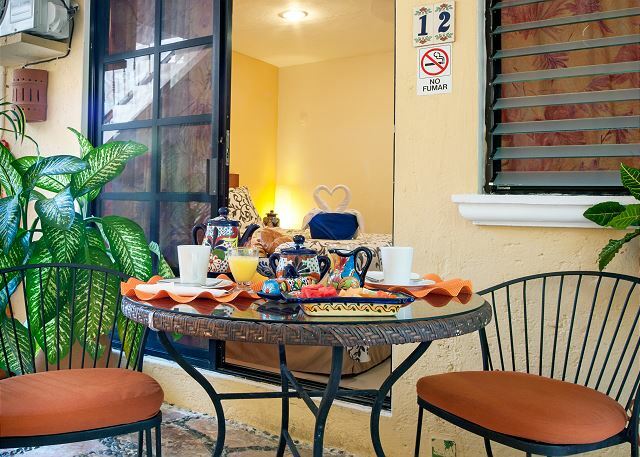 we had our morning coffee and breakfast at our outside bistro table prior to starting our day in Puerto Moreles. A short walk to the beach with the chairs provided. later in the day in the pool meeting all the other guests and sharing conversations just about everything. The staff and other guests were all very friendly which really adds to the ambience. The room was perfect! 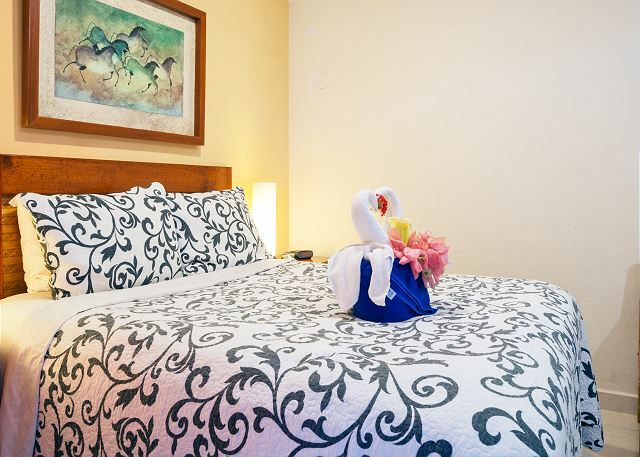 Clean, comfortable bed and overall a peaceful environment. The staff were kind and helpful. I would love to stay at Abbey del Sol again in the future. The location is very close to the beach and the beach bar Unico. This place has fantastic Ceviche. 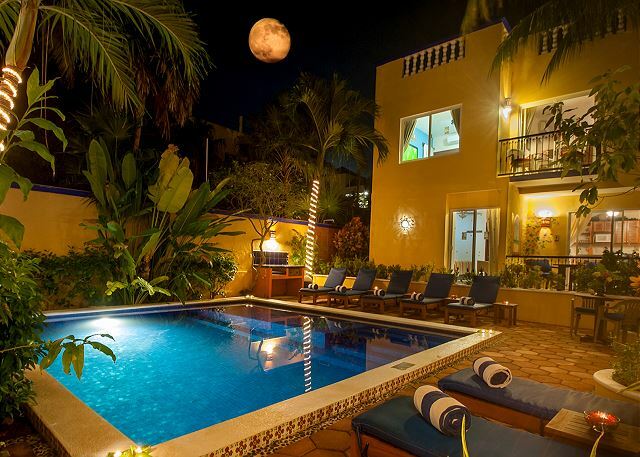 This is a very well-managed property, well located in Puerto Morelos. Staff is very helpful and friendly. Although the room #12 is the smallest on the property, we appreciated the free beach chairs and use of bicycles. Very nice studio/hotel style room. Grounds are beautiful and well maintained. Very nice to have bikes to use and it was a short 15 minute walk to town.Beach is 2 minutes away. Owners are on site and staff is extremely kind and helpful to assist with anything you require. Pleasant surprise! Lovely oasis in Puerto Morelos. Wish we could have stayed longer. We spent 9 days at Abbey del Sol in Puerto Morales Mexico. We had room # 12- which is their smallest and cheapest room. It was the only room they had available when we booked. It was small, but very nice and clean. Just around the corner from the pool. It had a queen bed, small fridge, microwave, and coffee maker. It also had a table and 2 chairs outside the room that you could use. This was a public space- frequented by staff and other guests, so it certainly wasn't private. But it served its purpose. Abbey del Sol was a very nice well run property. I really don't have anything bad to say about it. The staff was super friendly and helpful. It was within walking distance to town, and about 2 blocks from the beach. Yoga was held daily on the roof, which was also a good spot to hang and have a drink. Ours was the only room that didn't have its own lanai, so this was a good option for us. We would highly recommend Abbey del Sol, but I think next time I would opt for a larger room.I guess some folks book their room a year ahead of time to get the best choice, so book early. Great small establishment. Room was clean and comfortable.. Very quiet and relaxing. Bikes are a very nice addition allowing us to explore PoMo! Cute little place with everything we needed. We stayed in the studio room which had access to everything we needed. There was a small pool on site that was perfect for cooling off and most of the time we had it to ourselves. Also the room comes with a water cooler which was amazing. The room was clean and comfortable. Small fridge and coffe maker is a nice touch. We LOVED Abbey del Sol. It was exactly what we needed - a room, clean bathroom, fridge, microwave, towels, beach chairs, friendly staff, bike shares. It was only a block from the beach and 6 blocks from the town square - we loved it. It was great! The room was spotlessly clean and attractive. It is about the size of a small American hotel room, but laid out to be super efficient. The bathroom was very nice with a large walk in shower. There is a microwave, a coffee pot, plates and utensils, as well as a small refrigerator, so you can have breakfast and fix lunch if you want. 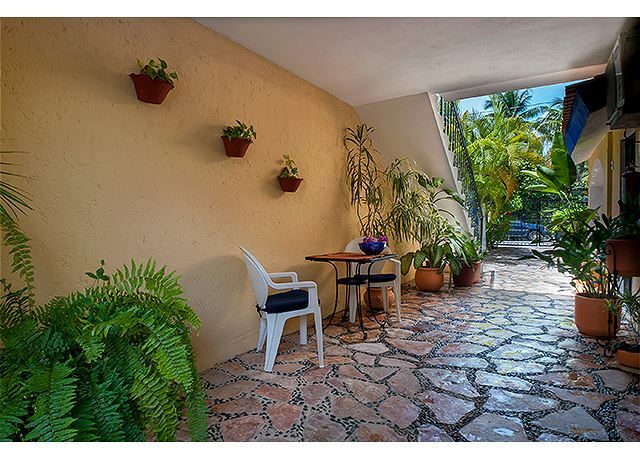 The whole property is beautifully landscaped, and you are just around the corner from a beautiful pool area with comfortable lounge chairs. The small table and chairs are place in a covered walkway outside the room, but it works out just fine and is very private. The management and staff are just wonderful as well! The room also has a flat screen TV, and a DVDS player, and there is a huge library of DVDs in the office to use. We enjoyed our stay tremendously. We love Puerto Morelos and definitely plan to stay with Abbey Dell still again. Very plesant snd helpful staff. Perfect location-bikes available for around town. Best snorkeling anywhere. Francisco G from Guadalajara, Jalisco does not recommend this vacation rental. Un excelente lugar para descansar. Abbey del Sol tiene todo lo que se necesita para pasarla bien en Puerto Morelos. Our vacation at Abbey del Sol was amazing. The property is very beautiful. The pictures do not do it justice. The pool and grounds were so gorgeous, I hardly wanted to leave and explore the other areas of Puerto Morelos. The use of bikes was a wonderful perk, as we rode all over town anytime we wanted. They had a nice little take out dinner that was served on site by some locals, that was such a nice little surprise. I really felt at home. I would definitely go back. Very nice place making our stay very enjoyable. The pool is a nice hideaway from the hot afternoon sun. The room we stayed in was very small and had no deck so the pool area was a blessing. Very nice. Clean smart!! Great owners and staff!! Will be back!! Love Puerto Morellos!! We had the small room which was super clean with all the amenities we needed for our stay. 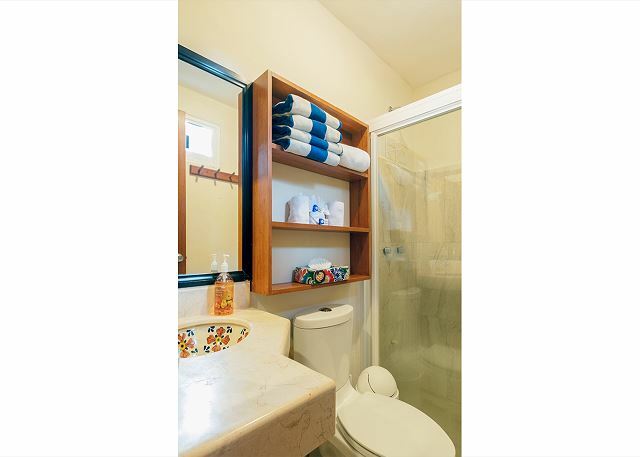 The bed was comfy, the bathroom nice size & plenty of hooks to hang towels & bathing suits. We really enjoyed staying here & would gladly stay here again. We returned to Puerto Morelos for one night. We returned our rental car and spent the night in Apartment 12 before leaving for the airport early the next morning. It was a perfect ending to a wonderful trip. Our special thanks to Nancy who takes care of the guests the same as she would her family. We appreciate you Nancy! Thank you. Perfect place to stay in PM! 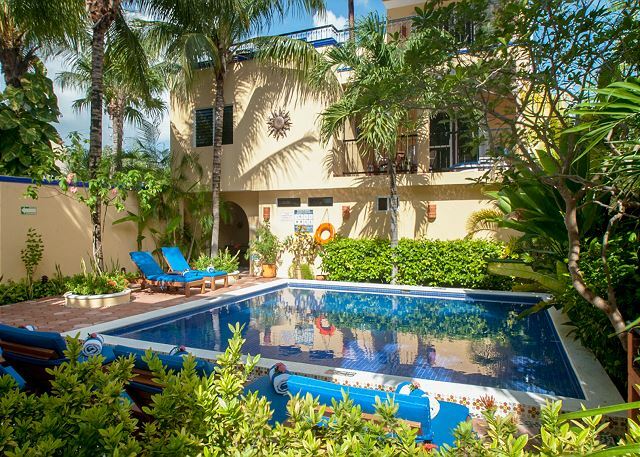 Abbey del sol 2 is a beautiful property with the pool and courtyard. 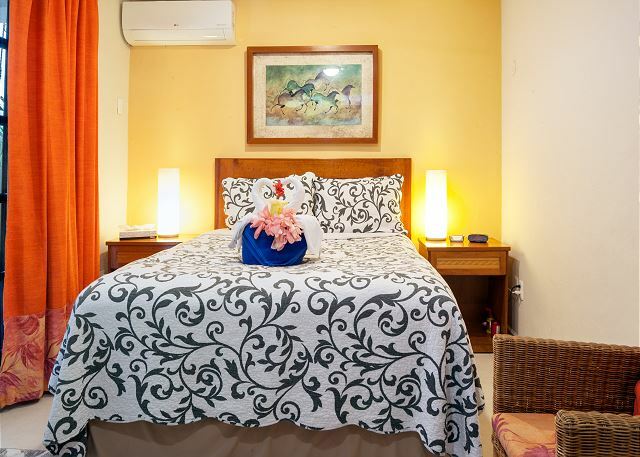 The location is just a 30 sec walk to the beach and very close to Unico beach club which is a must. Nancy was very helpful with any thing we needed, extra bottles of water ,laundry, helped book us a snorkeling trip, and helped when I got stung by a jelly fish. I will be back and I will stay at Abbey del sol 2! seguro y tranquilo perfecto para mi hija de 3 años y yo solas! I was part of a group meeting in Puerto Morelos. We were all very pleased. Pilar is a very helpfull and kind person. My stay in Puerto Morelos was the best vacation of my life. Extremely relaxed environment and sincere staff made my life for one week....perfect! Abbey del Sol two was so quiet you could hear a pin drop mid-day, poolside. Although my room (12) was simple, it was adequate, clean, well appointed and served my every need. Besides, how much time do you want to spend indoors anyway? If you truly need a break from reality go to Puerto Morelos. Its simple beauty and humble nature is inspiring. 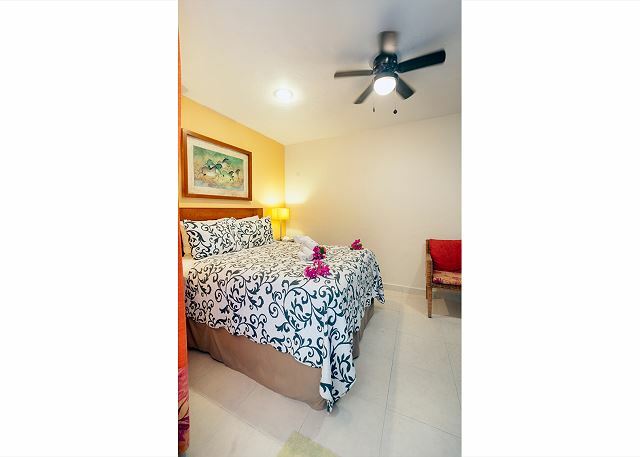 Great accomodations walking distance from beach. Friendly Professional Staff. Super clean and quiet location. Free bicycle use included in rental was help full. The bikes could use a little more maintenance but otherwise a total win. The staff was very welcoming and helpful-made us feel at home. We enjoyed Puerto Morelos a lot and felt safe there. We enjoyed our 3 night stay at Abbey Del Sol #2, room 12. It was super quiet and seemed to be the perfect spot for retirees looking for a haven in Mexico.